The suit alleges that O'Leary used a derogatory word for African-Americans and called the NFL "one big 'Ru-Ru' tribe." The suit also alleges O'Leary once advised coaches to check African-American players "to make sure their gums are blue, because they are bigger, faster and stronger than (African-American players) with red gums." "None of the individuals alleged to have been the subject of, or to have overheard, these supposed statements corroborated Mr. Ferraro's claims. 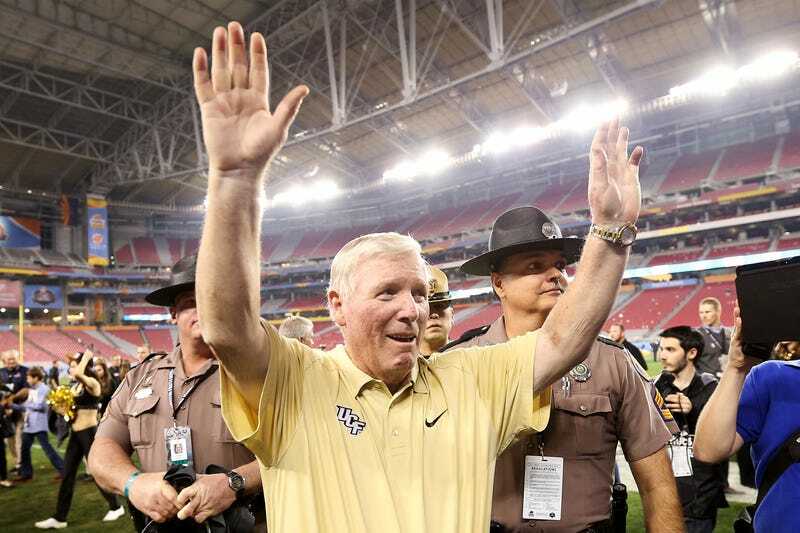 In fact, until seeking compensation after abandoning his job, it does not appear he ever discussed this with anyone at UCF." This isn't the first time George O'Leary has landed in hot water. In 2001 he resigned as head coach of Notre Dame just days after accepting the job, when it was revealed that O'Leary had multiple lies on his résumé. In 2008 UCF player Ereck Plancher died after a conditioning drill, and four players anonymously told the Orlando Sentinel that O'Leary and other coaches had cursed at Plancher for lack of effort during the drill. A jury would later find the UCF Athletics Association negligent in Plancher's death.